This New Year special edition concerns an encounter I had with super hard working cartoonist and artist, Katsuya Terada, and Hirokazu Yasuhara, the creator of the game “Sonic.” Because we were drinking and eating together, I really don’t recall the full content of our conversation very well. So, I have to tell you beforehand that these are simply my impressions. Some of you might have seen Terada-san create his drawings live, on sheets of paper on a wall at the “Juxtapoz x Superflat” exhibition held at the Vancouver Art gallery in 2017. In Japanese book stores I have seen his illustrations on the covers of famous novels. I saw paintings credited to him in an NHK Drama and I was really impressed with the wide range of his work. He also designs video game characters. People who enjoy games and animation are familiar with his paintings. We have been family friends with the creator of “Sonic,” Yasuhara-san, for more than 15 years. For the firstfew years I was unaware of his work, not being familiar with video games. I just thought, what an interesting man he was, treating me like a brother by sharing his hobby with me. Once I asked Yasuhara-san what behaviors and personality type he thought led to success. He said to challenge everything and be positive, stay in good humour and enjoy everyday life. What do we need to work creatively? Yasuhara-san said you must have passion about what you are doing and love your audience. These words have stayed with me and resurface over time. At the end of each year Terada-san has a solo exhibition in Los Angeles. To prepare for this he sleeps and eats well and paints hard. People who accomplish something big tend to be very energetic and are able to put in tremendous effort. I paint pictures, as well as picture books, and it’s very stimulating to meet someone with such a high degree of professionalism. Terada-san paints from morning to night. With an urgent deadline to meet, he paints using his iPad while eating saying, “Excuse me.” I was impressed by this and bought a big iPad Pro. I’ve got to practice painting on my iPad, but so far I’m just reading comics on it. My game-nerd classmate said, “Kao, you haven’t heard of the game “Sonic”? Hirokazu Yasuhara is a game-god”. Yasuhara-san, a god himself, called Terada-san a god. He asked for his autograph, and was crazy happy to get it. I am grateful to my readers who read my columns and don’t send me nasty emails. I will do my best to keep on writing “Hatarak-ing (working)” column for the coming year. With the help of alcohol and cosseted by the gods of cartoons and games, I felt happy and that the signs were good for the new year. I promise to try my best in the coming year. (From the December issue) I returned to Vancouver from Japan and without resting fl ew to L.A. to catch Terada-san’s solo exhibition. Other artists I know were also heading to the exhibition, so I thought it would be like a reunion. I was impressed by the people gathered in the gallery. I stood talking with my favorite artist, Audrey Kawasaki, without realizing it was her until we introduced ourselves. There were also famous movie directors, screenwriters and actresses, etc. 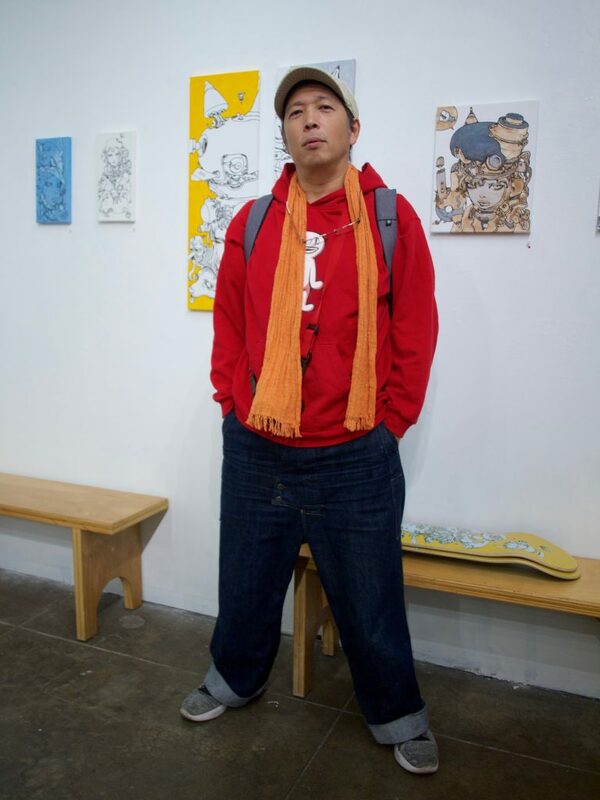 James Jean, famous worldwide, was there as well. I knew his face from a TV documentary and was excited to see him there. I saw a woman who resembled a character in one of his large canvases at the Vancouver Art Gallery. I spoke to her and found out that she was his wife. At the end of the year I dashed around Japan, the US, and saw Japanese, Nikkei and people of Asian background who are active on the world stage. I was very proud to be an artist and Japanese. The Bulletin/Geppo magazine has covered many Nikkei artists and workers. We continue to support them making a leap forward into the world of 2018. The piece originally appeared in Japanese in the January 2018 issue of The Geppo.